Beachfront Anahola 4 Bedroom/Loft with Fabulous Ocean Views! This 4 bedroom plus loft beachfront home sits only 15 feet from a sandy beach! Every room at this incredible beachfront location offers a breathtaking view of the ocean! Excellent snorkeling and swimming on this calm reef protected bay! Very private beach area. The home with dozens of windows overlooking the turquoise water offers 4 bedrooms plus a loft sleeping 10, with 3 baths. There are 1 king, 3 queens, a sleeper sofa and two day bed type sofas. There is air conditioning in each of the bedrooms. 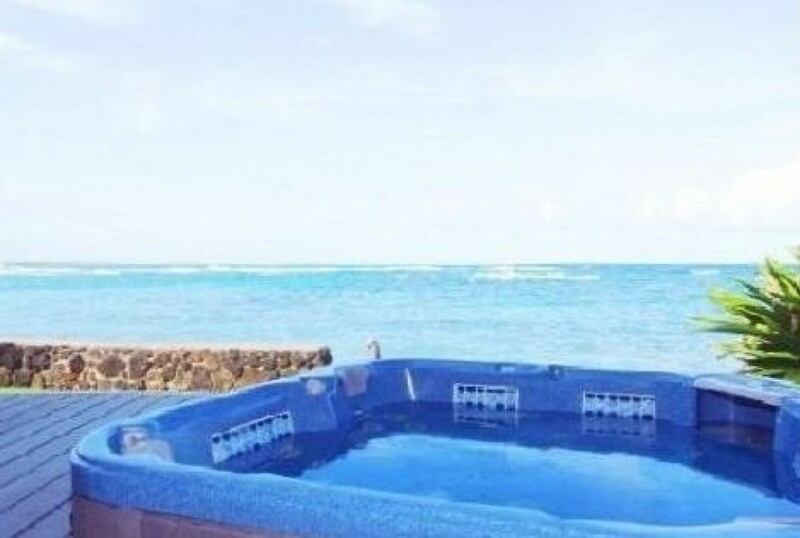 There is a large outdoor patio with 4 person hot tub overlooking the ocean as well! Full kitchen with all utensils. Lots of games, books and toys for kids and adults. Great home for kids since the water is calm and the beach is so close to the home. Parents can watch kids play in the water without having to get in themselves. Book in advance. This home books almost year-round!